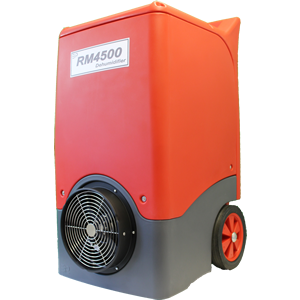 The RM4500-H Dehumidifier is another addition to the EIPL range of Rotational Moulded Polyethylene Housings. This super durable housing, and EIPL’s years of experience with refrigeration systems, ensures the product not only looks the part, but is also capable of outperforming competitors models with similar capacities. The RM4500-H is also available in Dual Voltage making the unit ideal for the hire trade. The robust ridged handle and large diameter durable wheels ensures transport and manoeuvrability are not compromised. It’s lightweight yet robust design is ideal for commercial and residential work. Best of all, it’s affordably priced within the budget of most restoration specialists. ​The RM “e” and “e+” range of products incorporate a smart phones interface, allowing data logging, graphing, diagnostics, plus many more features. No more worries of forgetting to empty buckets, due to customer demands the RM range of products incorporate high capacity condensate pumps. The 3m maximum pump height will ensure no installation is too difficult. Install, connect to a permanent drain, and forget until the job is complete. With the aid of a purge facility, all residual water can be drained from the pump tank prior to moving the machine therefore eliminating the chances of spillage. The RM4500-H is equipped with a “Reverse Cycle” defrost system, ensuring a quick and efficient clearing of ice from the coil, allowing a minimum operating temperature of 3°C. Sometimes the less expensive features are overlooked. The RM4500-H is supplied complete with cable and hose tidies. Not only will this reduce the possibility of damage when the units are transported, but also provides easy installation when positioning the equipment. The EIPL RM4500-H Professional Dehumidifier is a rugged, yet mobile piece of equipment that will operate under extreme conditions and pull large amounts of moisture from the air. Whenever there is a need for fast dependable, energy efficient drying, EIPL can provide the answer. The high efficiency Rotary compressor and “Dual Cool” HGR system, ensures the maximum extraction with the lowest running costs.